Organic aloe vera has a wide range of uses. It can be applied to a burn for relief, it can be used as part of a healthy skin routine and a wide range of other uses. Sometimes it can even be taken orally to improve one's health. One of the best ways to access the 200 active components in aloe vera is by using a quality gel. This review will compare 10 of the most popular organic aloe vera gels on the market. Only one gel listed is food grade and approved for human consumption. The Verdict - Which Is The Best Organic Aloe Vera Gel? 1. 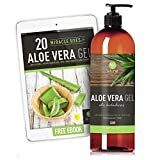 What Organic Aloe Vera Gel? Organic aloe vera gel is made from the liquid inside the leaves of the aloe vera plant. This single ingredient contains over 200 active components that help keep skin healthy. This includes amino acids, fatty acids, vitamins, minerals, glycoproteins, polysaccharides, enzymes, and anthraquinones. While it is fairly easy to find aloe vera gel on the market, not all gels are created equal. Many gels use harmful chemicals to stabilize the aloe vera for a longer shelf life. These gels may also not be farmed organically. A good quality aloe vera gel should not contain parabens, sulfates, propylene glycol, petrochemicals, sodium benzoate, carrageenan, triclosan, phthalates, fragrances or artificial dyes. Most of the products on this review are meant to be used topically, which means they are not safe to be consumed. The only products that should be ingested are the ones marked as being food grade. This product can be used on a daily basis as a part of a healthy skin routine. It makes a great aftershave for the face and body. It also can become a toner used to clean pours. Many people enjoy this product on the scalp too as it helps to unclog pores and stimulate hair growth. Organic aloe vera gel also has several applications tied to treating everything from burns to bug bites. It has both anti-inflammatory and anti-bacterial properties that make it a key part of any first aid kit. It also makes a safe hand sanitizer, a fast cure for diaper rash and helps bruises go away. Because there are 200 active components in aloe vera, this gel works to not only sooth injured skin but also keeps infection out. It contains active ingredients that work to stop pain, keep skin moisturized and also repair damage due to cuts, burns and insect bites. While just about any store caries some version of an aloe vera gel, they are not all organic or pure aloe vera. Larger retailers like Trader Joes and Natures often carry at least one brand of organic aloe vera gel. Customers should be able to check the labels of aloe vera gels to see if they contain harmful chemicals. All the brands listed can also be ordered online. The Aloe Farms Aloe Vera Gel Organic came in at the most budget-friendly gel at about $. an ounce. The Seven Minerals - Aloe Vera Gel was the highest priced gel at $ an ounce. The following products were reviewed based on the following parameters: Features, Pros & Cons, Where to Buy, Price and Warranty. We compared customer experiences with each product and consumer reports as well. Another part of our comparison was tied to the variety of uses each gel had. On the low end, the per ounce price was right about $. On the high end of our list, the aloe vera gel hit $3.13 an ounce. Made from aloe vera juice and certified organic. They use a cold-press method to make the gel so they can get more of the natural healing power. The gel even comes in a portable form so customers can throw one in their gym bag, purse or diaper bag. They make this gel from 100% natural ingredients and 99% organic aloe vera. There are no added colors, scents, or alcohol. It is safe for use on skin, hair, and cuticles. They also approve it for topical use on sunburns and razor burns. This product can be found in stores and online for around $ for an 8-ounce bottle. OUR ALOE VERA GEL is 99.5% organic made only from cold-pressed Aloe Vera, Vitamin C and natural preservatives. It is unscented, fragrance Free and doesn't contain alcohol. IT'S AN ALL NATURAL SKIN MOISTURIZER that acts as a cooling gel. Soothes and hydrates dry, itchy skin, great for dandruff, itchy scalp, insect bites, sunburn, razor burn, and rashes. NON-STICKY ALOE GEL that penetrates quickly with no sticky residue leaving your skin and hair silky smooth and hydrated. USE IN DIY PROJECTS to make your own skin and hair care products such as an after shave cream, body moisturizer or after sun lotion. MADE IN USA and backed by Sky Organics money back guarantee! They make the gel from all natural ingredients that are 99.5% organic. They make it from cold-pressed aloe vera to preserve the healing powers of the aloe. It also contains Vitamin C and all natural preservatives. It is also specially formulated to not leave any residue or sticky feeling behind. They make this product from 99.75% organic materials, but it is not certified organic. They formulate it to be gentle on skin and easy to use for the baby, the family and pets. All natural ingredientsCan be used on skin, hair, and nails. This is a food grade product. It is certified 100% natural but not certified organic. This formula differs slightly from some other gels that can not be used internally. It is safe to mix this product with fruit juice to drink it. This product comes with a one-year guarantee to be 100% natural and organic. It has no added chemicals, allergins or toxins. This is one of the more liquidy gels on the list, but this is due to a lack of thickening agents. This is about as close as you will get to a pure source of aloe vera. This bottle comes with DIY recipes to create creams, topical treatments, and more using aloe. 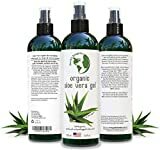 They make this product from aloe vera grown in the United States and certified to be organic through the State of California. It contains 98% pure aloe vera. This is one of the thicker products on the list and comes on a shallow lotion type package with a screw-on lid. Cold-pressed and 100% certified organic ingredients set this gel apart. They also make the packaging for ease of use as it comes with both the pop top and a pump. All the ingredients are also cruelty-free and natural. A WIDE VARIETY OF USES! EOL Beauty's Aloe Vera Gel is one of the most versatile healing skin treatments available. It can be used to repair and restore irritated, sun-damaged or newly shaven skin, as well as on hair to fight dandruff or as a styling aid. The possibilities are endless! CONDITION & SOOTHE Our natural formula is cooling as it glides onto the skin to soothe, lock in moisture and reduce inflammation. Use it to relieve sunburns, dry skin, minor cuts, insect bites, chaffing, rashes, and other skin irritations. A MUST-HAVE FOR SUNBURNS Our EOL Beauty Aloe Vera Gel is commonly used to treat burns and sunburns because it is instantly cooling and soothing while it prompts cells to rebuild with increased oxygen and moisture. BACKED BY OUR NO QUESTIONS ASKED SATISFACTION GUARANTEE You have absolutely nothing to lose and just happy, healthy skin to gain! Every household needs a bottle of this highly versatile and incredibly effective aloe vera gel. This product is certified organic. They also back it by one of the best guarantees in the market; they offer your money-back, no questions asked. The product is one of the less thick gels that ships with a pump for ease of use. So, which is the best organic aloe vera gel? When we compared all the products based on cost, there was a clear winner. The Aloe Farms Aloe Vera Gel Organic ships in bulk, and the price reflects this. The 32-ounce jug with no frills packaging is less than $ an ounce. The fact that this product is also food grade aloe vera meant it is the most flexible product on the list. You can use this formula on skin, hair, nails and also consume it. This product also seems to be the most reasonable for long-term use since it is so budget friendly. Another favorite on the list is the Aloe Vera Gel Organic For Face, Hair, Skin by La Lune Naturals. It seems to be the perfect consistency for many uses and even comes with a DIY recipe book for many topical uses. It is also reasonably priced at about $ an ounce. The Sky Organics—99.5% Organic Aloe is another product worth a second look. The added vitamin C makes this product even more beneficial for some users. While most of the products on this list seemed to sit mid-price range, there was one that appeared to be over-priced. This was the Seven Minerals - Aloe Vera Gel. The $ price tag was reasonable until you notice this is for a tiny 3.2-ounce travel bottle. This may be a case of trading convenience for value since this puts is at over $ an ounce. There wasn't much different about this product to warrant being so much more per ounce.